During the 2008 presidential campaign, Barack Obama was accused of palling around with terrorists. This Republican canard was focused on the former Weatherperson, Bill Ayers, but also on Rashid Khalidi, the respected Palestinian-American scholar who had been a friend of Obama’s in Chicago. From some of his early connections and early comments there was thought that Obama might be more sympathetic to Palestinian rights than most U.S. politicians. But as he moved from the state legislature to the U.S. Senate and the national stage, Obama took the usual route of seeking the blessings of the Israel lobby — just as he moved from community organizer to corporate shill in domestic politics. So, yes, during the campaign Obama did have a few advisers who rejected rabid positions on Israel-Palestine, like Robert Malley. But when Malley was criticized for having spoken to Hamas, the Obama campaign courageously declared that he wasn’t a significant adviser and that he would have no further connection to the campaign. And, yes, the Obama campaign did say that he would talk to anyone. But he then explained that this only included countries, so Hamas was excluded. And, yes, Obama went and spoke to AIPAC, the rightwing Israel Lobby, and departed from standard U.S. policy. Unfortunately, his departure was to move to the right of the Bush Administration, calling for Jerusalem to remain Israel’s “undivided” capital — though he backed off from this the next day — and criticizing Bush for allowing Hamas to participate in the Feb., 2006 Palestinian elections. But this was all during the campaign and we know that candidates will say anything to get themselves elected. So there was still the possibility that despite his campaign rhetoric, once in office the wisdom gleaned from those dinners with Rashid Khalidi would assert itself. An early Obama appointment offered some hope. George Mitchell was named special White House envoy to the Middle East; Mitchell had previously headed a fact-finding commission on the Al-Aqsa intifada in 2001 whose report was relatively balanced. But in other respects, Obama’s first month wasn’t promising. One of the administration’s early nominees was Chas Freeman, a veteran diplomat who had been willing to criticize Israel. Great. But when Freeman was attacked, Obama refused to support him, letting him flutter in the wind until Freeman withdrew himself from consideration. Also in his first month, Obama decided to visit the headquarters of the Caterpillar Corporation and sing their praises, even though church groups, human rights organizations, and peace activists urged him not to do so given that Caterpillar was in violation of international law and basic morality in selling armored bulldozers to Israel used to smash Palestinian homes and olive groves as part of Israel’s colonization of the occupied territories. The 2008-2009 Gaza war officially ended just before Obama was sworn in as president. There’s only one president, said Obama, as he maintained general silence on the matter, but with his aides pointing out that he was on record supporting Israel’s right to defend itself from rocket attacks — which of course was a wholly misleading way to characterize the war — this was taken in the Arab world as tacit assent to Bush’s policy. Some analysts hypothesized that Israel ended its offensive when it did precisely so as not to put Obama to an early test. But in the months that followed Obama failed the test time and time again. On February 23, Amnesty International released a report in which they condemned war crimes on both sides in the Gaza war and called on those who supplied arms to the two sides to cease doing so. The response of the Obama administration was to ship what Amnesty called a “massive consignment of munitions” to Israel the next month. From the beginning of his administration, Obama declared that he was concerned over the humanitarian crisis in Gaza and that he wanted the blockade of Gaza loosened. But Israel ignored him and the United States did nothing. Fifty-four Representatives urged the United States to apply real pressure on Israel to lift the blockade, but to no avail. There was and remains a very simple solution if Obama genuinely wants to mitigate the effects of the blockade: namely, the United States could do what Rep. Brian Baird of Washington suggested: break the blockade. Just sail supplies in by sea. Israel certainly isn’t going to sink U.S. navy vessels. How does Obama’s policy on Israel-Palestine compare with that of George W. Bush? This is not an easy comparison to make. After all, the circumstances faced by the two administrations have varied: for example, there have been different political parties in power in Israel to deal with, and different wars and atrocities to address. In recent years, the General Assembly has passed about 250 resolutions annually. Some two-thirds of these resolutions, however, have been passed without a vote: they were consensus decisions, often about rather non-controversial matters. So, for example, in both 2007 and 2009, there was a resolution passed without a vote in favor of “improving global road safety.” Some other resolutions that passed by consensus in both sessions opposed violence against women migrant workers, called for steps to combat malaria, urged the building of a better world through sports and the Olympic ideal, and so on. Some of the consensus resolutions seemed as if they had greater significance — such as resolutions that approved African and Middle Eastern nuclear-free zones — but these tended to be toothless declarations, so blandly formulated that even the Middle Eastern country with one to two hundred thermonuclear warheads, Israel, was able to go along without breaking a sweat. But not every General Assembly resolution has passed by consensus. Typically, a quarter to a third of them have involved contentious issues, and therefore there has been a recorded roll-call vote. And often virtually identical resolutions are voted on several years running. So we can compare how the Bush Administration voted on a resolution and then look and see how the Obama Administration voted on essentially the same resolution two years later. Now, as noted above, some General Assembly resolutions were really nothing more than endorsements of motherhood and apple pie. But it is true that the Bushites were not invariably supportive of these seemingly unexceptional resolutions. Throughout the Bush Administration, the U.S. delegate voted against a resolution affirming the rights of the child: in 2007 the vote was 183 countries in favor and 1 opposed, the United States. Likewise, the United States voted against a resolution urging support for a Convention on the Elimination of All Forms of Discrimination against Women (154-1-0) and voted no on a resolution affirming that people have the right to food (186-1, with North Korea abstaining). These votes of course did nothing to further U.S. foreign policy interests, no matter how crudely or selfishly defined — it’s not as if the resolutions obligated rich nations to end the global inequality that especially burdened women and children or even to ship one peanut butter sandwich overseas. But to the Bush Administration such resolutions had the whiff of socialism, so they voted no. For Bush, success in diplomacy seemed to be measured by how many people around the world came to hate your guts, and by this measure he was very successful indeed. But Obama knows that in-your-face diplomacy doesn’t gain anything, so he has been eager to improve the U.S. image. Accordingly, he allowed the 2009 resolutions on children’s rights, discrimination against women, and food to be adopted unanimously. On several nuclear weapons resolutions, Obama continued Washington’s historic isolated opposition. On a few nuclear weapons resolutions, however, Obama has distanced himself from the Bush policy in ways that are substantive, rather than simply cosmetic —a reflection of the modest but real improvements Obama has made relative to Bush on nuclear policy. So what about Israel-Palestine resolutions? Some resolutions came up in only one of the sessions but not the other. So there were two resolutions in the current session on the Goldstone report, calling on both Israel and Hamas to investigate their alleged war crimes during the Gaza war. Washington was one of 18 countries voting against the first of these resolutions and one of 7 voting against the second. But because there was no comparable 2007 resolution, we can’t compare the Obama and Bush Administrations. Likewise, in 2007 the Bush Administration and Israel were the only ones to vote against the financing of the UN Interim force in Lebanon — but there was no comparable resolution in 2009. There were enough resolutions, however, that were put forward in both the 62nd and the 64th session that we can perform a meaningful comparison. Under Bush, in 2007 the United States cast negative votes on 15 Israel-Palestine resolutions where it was joined by fewer than 10 of the UN’s 192 members. Generally it was joined by Israel and some of the small Pacific islands that host U.S. military bases and are virtual dependencies of the Pentagon — like Micronesia and the Marshall Islands — and about half the time it was supported as well by Canada and Australia. What’s crucial to note here is that Bush was not just choosing sides in a North-South face-off, or a debate between democracies and authoritarian states; rather, the U.S. position was isolated from a large majority of the world, including most of the North and most democracies. Should the Geneva Convention apply to the Occupied Palestinian Territories (Res. 62/107)? The United States was one of 6 countries voting no. On resolution 62/83 criticizing Israel’s construction of the wall (which had been declared illegal by the International Court of Justice) and otherwise calling for a peaceful settlement of the question of Palestine, Washington cast one of 7 negative votes. On resolution 62/84 expressing concern at Israeli actions in Jerusalem that violated Security Council resolutions that the United States itself had previously supported, the U.S. was one of 7 no votes. Likewise on resolution 62/85 that criticized Israel for violating a prior Security Council resolution on the Golan Heights, again passed with U.S. backing, Washington was one of 7 negative votes. On resolution 62/108 condemning Israeli settlements in the occupied territories, the United States was one of the few to vote no. On resolutions affirming the Palestinian right to self-determination (62/146), their sovereignty over their land (not including the pre-1967 territory of Israel) (62/181), their right to their property (62/105), and the right of those displaced in the 1967 war to return to their homes (62/103), the United States was part of the tiny minority voting no. On four resolutions supporting the work of various UN bodies seeking to promote the realization of Palestinians’ rights and well-being (62/80, 62/81, 62/82, 62/104), the United States was one of a handful of nations voting no. On resolution 62/56 warning of the risks of nuclear proliferation in the Middle East, only the United States, Israel, and four Pacific microstates voted no. And on resolution 62/188 calling on Israel to pay for the clean up of the oil slick on Lebanon’s shores caused by the Israeli bombing of oil storage tanks during the 2006 war against Hezbollah, Washington was one of only 8 no votes. OK, so how did the Obama Administration vote on these same 15 resolutions two years later? (64/92, 64/19, 64/20, 64/21, 64/93, 64/150, 64/185, 64/90, 64/88, 64/16, 64/17, 64/18, 64/89, 64/66, 64/195) Exactly the same way. In each case it was part of a group of fewer than 10 countries that voted no in the face of overwhelming international support. In fact, there was a 16th resolution, 62/109, that the Bush Administration had abstained on — it criticized Israeli human rights practices in the Occupied Territories (something obvious to anyone who read the U.S. State Department’s annual human rights report). When this resolution came to a vote in 2009 (64/94), the Obama Administration did not abstain: it voted no, along with only 8 other nations. In short, the Obama Administration’s record in the General Assembly shows that it has been at least as supportive of Israeli oppression of the Palestinians and regional aggression as was Bush. Now of course the General Assembly is not the real center of power at the United Nations. That’s the Security Council and the United States cast a veto on behalf of Israel in the Security Council 9 times under George W. Bush and not once under Obama. But vetoes, which once gave a pretty good indication of the role of the major powers in the Security Council, no longer are that informative. Since the late 1980s the permanent five members of the Council have often wielded their authority more indirectly, through use of what Céline Nahory has called the “The Hidden Veto.” Meeting behind closed doors, rather than in official open sessions, without any record of what has been said, the P5 can issue private veto warnings before a vote takes place, blocking action they oppose without having to appear obstructionist in public. In Obama’s Security Council, as in Bush’s, no resolution has been adopted critical of Israel. Indeed, under Obama, there has not been a single Security Council resolution adopted that includes the words “Israel” or “Palestine.” Israel essentially continues its immunity from Security Council condemnation. So in both bodies of the United Nations — the General Assembly and the Security Council — there has been no significant difference between Bush and Obama on Israel-Palestine. In May 2009 Obama “demanded” that the Israelis stop expanding their settlements. This was no more than a demand that Israel comply with international law and the Fourth Geneva Convention — or more precisely, a demand that Israel stop new violations of international law while maintaining its already established settlements, whose continued existence is an ongoing violation of international law. In its opposition to Israeli settlements, the Obama Administration was breaking no new ground. As Hillary Clinton explained, “For 40 years, successive American administrations of both parties have opposed Israel’s settlement policy.” But of course, what is also a fact is that the United States has stated its opposition to settlements but then done absolutely nothing to stop them. Given that in the years since World War II the United States has provided more aid to Israel than to any other country in the world, given that Israel has been the leading aid recipient from 1975 to 2004, given that more than half of all vetoes cast by Washington have been on behalf of Israel, given that the U.S. bestows innumerable special privileges on Israel — surely the United States could get Israel to stop building settlements if it had wanted to. That there should be no new construction, not even for natural growth, was in fact part of the so-called Road Map, drawn up by the Bush Administration, endorsed by the Quartet — the United States, Russia, the EU, and the UN — and signed by Israel. Israel now claims that the Bush Administration released them from these Road Map obligations, but both the Bush and Obama Administrations deny that this was the case. (For example, National Security Adviser Stephen Hadley declared on May 7, 2008: “We basically have said our position on settlements is … the road map position, which is that there must be an end to settlement expansion, a full stop.”) Condoleezza Rice did explain that just because the United States says stop, doesn’t mean that Israel will stop. And of course that’s true if it’s clear that Washington will do nothing to get Israel to stop. That pattern has continued with Obama. He made his May 2009 settlement “demands” and Netanyahu refused them. The Israeli prime minister said he would freeze West Bank settlement construction for 10 months, but that this wouldn’t cover building in Jerusalem, or already approved West Bank construction, or natural growth or militarily required construction, or public facilities, or exceptional circumstances, or West Bank construction after the 10 months was up. Obama accepted this and both Clinton and Mitchell praised Netanyahu for his unprecedented offer. Rather than putting pressure on Israel to comply with its signed obligations, the Obama Administration put pressure on the Arab states to tell the Palestinian Authority — give it cover really — to agree to indirect talks with Israel, so-called proximity talks, despite the ongoing settlement activity. Commentators were unanimous in not expecting much from these proximity talks. The Israeli foreign ministry issued a secret report to Israeli embassies telling them that the talks were not a top Obama priority and not much would come of them. But then came the announcement approving construction of 1600 new housing units in East Jerusalem, just as Vice President Biden was in Israel affirming the United States’ strong commitment to the Jewish state. It would be hard to imagine a more blatant attempt to sabotage the talks. Nor a more direct challenge to U.S. credibility. And international bullies like the United States do care about their credibility, for if their threats are not believed, if they can be humiliated without consequence, then their power is that much less. Sometimes moments like this can have a profound effect — shaking things up enough to cause U.S. policymakers to distinguish between those areas where Israeli interests and U.S. imperial interests coincide — in terms of crushing radical and nationalist movements in the region — and where they diverge, which they have always done on the issue of the settlements. Giving a state to a cooperative Palestinian leadership under Mahmoud Abbas doesn’t undermine U.S. imperial interests. Indeed, it has always been the case that U.S. backing for Israeli oppression of Palestinians entails real costs to U.S. interests. Thus General Petraeus testified in March that the Israeli-Palestinian conflict “foments anti-American sentiment, due to a perception of U.S. favoritism for Israel” — a perception! — which weakens the U.S. position in the Arab world, undermines the legitimacy of pro-U.S. regimes, and helps al-Qaeda and other militant groups mobilize support. The rightwing Israel Lobby —still quite powerful despite the challenge to its monopoly by J Street — has denounced Obama’s picking on Israel. But it’s not just AIPAC that keeps Obama from using the United States’ vast leverage to demand a settlement of the Israel-Palestine conflict. Although the United States gets nothing out of the Israeli occupation of the West Bank or of settlement construction in Jerusalem, it has long traded its acquiescence in the occupation in return for other Israeli services to the U.S. empire. As the New York Times’s David Sanger and Isabel Kershner reported (3/18/2010), “what has many in Washington worried most is the magnitude of the breach with Mr. Netanyahu, at a time that the two countries are intent on showing that they are working hand in hand on a strategy to counter Iran and its nuclear program.” In other words, Israel is seen as a useful ally for maintaining U.S. hegemony in the Middle East. It is still unclear how this current flare up will resolve itself. In Biden’s Tel Aviv University speech immediately following the insult, he criticized the Israeli announcement, but then went on to express his appreciation for Netanyahu’s clarification “that the beginning of actual construction on this particular project would likely take several years” — as if a long-term commitment to build in East Jerusalem weren’t just as damaging to peace prospects as one that started now. On the other hand, the follow-up conversations were much tougher, with Clinton and others demanding that Netanyahu cancel the building project. Netanyahu has dug in his heels, proclaiming that Jerusalem is not a settlement, but Israel’s capital. The crucial question, however, now, as always, is what sort of leverage the United States will use to get Israel to comply with international law and the U.S. peace process? Will the Obama Administration use the threat of a reduction in military aid or a withdrawal of diplomatic support to force Israel into line? On military aid, Israel seems not to have much to worry about. On March 12, Hillary Clinton declared that “the United States is a strong supporter of the security of Israel. Always have been, always will be.” And two weeks later Haaretz reported (3/25/2010) a huge new U.S.-Israeli arms deal. In terms of diplomacy, there were rumors that Washington might consider abstaining on (and thus not vetoing) some future Security Council resolution condemning Israeli settlements in East Jerusalem; but this report was soon denied. And when a story was published indicating that some former national security advisers had recommended that the United States put forward its own peace plan (as the Palestinians want and Israel opposes), the current National Security Adviser made clear that that was not in the cards. It’s possible that Obama will try to force Netanyahu to alter his governing coalition, or even try to oust him from office — as Bill Clinton did in 1999. (When Prime Minister Netanyahu backed away from Israel’s Oslo commitments, the U.S. President twice refused to meet with him in Washington, while meeting with Arafat, helping to weaken Netanyahu before the next Israeli election, enabling his replacement by Ehud Barak.) But given that the Labor Party is already in Israel’s ruling coalition and that even President Peres insists on Israel’s right to build in Jerusalem, it’s going to take more than that to move the peace process forward. It’s going to take real cuts in aid and an end to diplomatic backing, for which Obama has yet to show any sympathy. Without massive political pressure on Obama, it seems that we’re not going to see major departures from prevailing U.S. policy any time soon. Without that pressure, Obama will continue — as he has thus far continued — the long-standing policy of arming Israel as it slaughters Palestinians, protecting it from any consequences or sanctions as it suffocates the people of Gaza, providing it with diplomatic cover as it further restricts the scope of a future Palestinian state, and granting it legal impunity for its war crimes. In short, the United States will continue its long-term policy of palling around with terrorists, the terrorists who lead the Israeli state. STEPHEN R. SHALOM is a member of the New Politics editorial board. 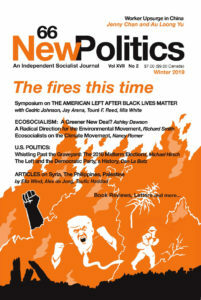 This article is based on a talk given at the Left Forum in New York City, March 21, 2010.